(Recto, mount) inscribed in brown ink, at lower center below image: "Interior of the Fort immediately / after its Capture." 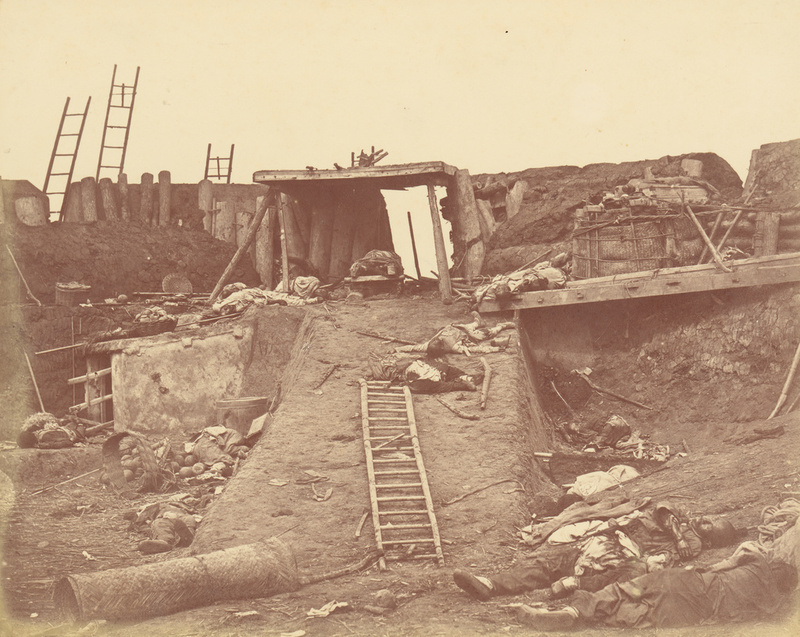 Beato photographed the North Taku Fort shortly after its capture, creating a sequence of eight views in order to vividly re-create the event. A British military physician, Dr. David F. Rennie, recalled in his memoir of the campaign: "I passed into the fort, and a distressing scene of carnage disclosed itself. . . . Signor Beato was here in great excitement, characterising the group as 'beautiful, ' and begging that it might not be interfered with until perpetuated by his photographic apparatus, which was done a few minutes afterwards. " Worswick, Clark and Jonathan Spence. Imperial China: Photographs 1850-1912 (New York: Pennwick Publishing, 1978), p. 36. Cameron, Nigel and L. Carrington Goodrich. The Face of China as Seen by Photographers & Travelers, 1860-1912. (Millerton: Aperture, 1978), p. 36.